This first volume is a rich and varied collection of feminist “click” stories. It is edited by Marguerite Andersen. In response to an open call, women from all parts of Canada tell share how they came to define themselves as feminist. The contributors are diverse, illustrating the interplay of gender, race, class, geography, culture, dis/ability, language, sexual identity, and age in women’s experiences. The collection speaks to what is at the heart of feminism – a deep desire for the full development of every girl and woman, a dedication to an affirming society, a capacity for openness and learning, a commitment to community, and, a willingness to make change personally and systemically. The personalities and experiences, turning points and transformations, jump from the page, embracing the reader in a journey to both familiar and new places. Marguerite Andersen, born in Germany, is a teacher, a writer, a mother and grandmother, who has lived in Canada since 1958. She has taught at all levels, including the University of Guelph (where she was Chair of Languages and Literature and a founder of the first women’s studies program in Canada), Concordia University and Mount Saint Vincent University (where she held the Nancy Ruth Chair in Women’s Studies). In 1971, she published Mother was Not a Person, a collection of feminist essays that sold a remarkable 6,000 copies. Marguerite has published more than ten works of fiction, short stories and poems. 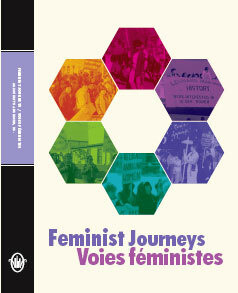 We are pleased to post stories about how women came to identify as feminist, following the theme of our first book, Feminist Journeys/Voies féministes, edited by Marguerite Andersen. We’ve included some of these voices in the comment section below. Please feel free to join the conversation by adding your comment..